“Near the end of last summer our A/C stopped cooling. It ran out of refrigerant, and being almost 20 years old I guess I wasn’t surprised. Instead of having it recharged, we decided to replace it. Our gas furnace is only 5 years old because we had to replace it after our basement flooded. So, this time around, it was just adding the new A/C unit that is compatible with the newer 90% efficient furnace. Rather than wait till the spring, we had the central air unit replaced right away and I’m glad we did because we got 3 weeks of gorgeous – and hot – Indian summer weather and we used the new A/C on several of the warmest days. Up to 18.5 SEER – Energy Star qualified. 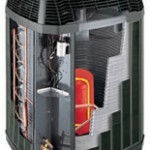 2-stage cooling for more balanced temperatures and quieter operation. Uses environmentally responsible R-410A refrigerant. ComfortLink II on some models enhances total system performance for optimal home comfort. WeatherGuard II top and fasteners product outdoor unit from the elements. Louvered side panels provide better protection and optimal air flow. Galvanized steel cabinet is coated with baked on powder paint. Multiple noise-reduction elements include compressor sound blankets. DuraTuff base pan won’t rust or corrode. Spine Fin coil dissipates heat more rapidly. Variable speed fan motor reduces noise. Sizes: 2, 3, 4 and 5 ton. 12-year limited warranty on the compressor; 10-year limited warranty on the coil and all functional parts. Professional heating and cooling contractors have a specific set of skills along with the experience and the tools to install central air conditioning units, a tricky job. Hire a qualified contractor and it will give you the confidence that your central air conditioner is installed safely and that you will get the best performance and energy savings you expect.